I had the opportunity to see The Secret Garden with my family and it was BRILLIANT. The choreographer, Will Tuckett brought Frances Hodgson Burnett’s popular children’s novel to life with beautiful dancing, costumes, puppetry, and narration. Tuckett is no stranger to creating memorable productions and is the recent recipient of England’s 2014 Olivier Awards. My 7-year old was impressed by the amazing narrator who memorized all those extensive lines. The nice English accent and handsome looks must have contributed to the impact! My 4-year old loved all the oversized puppets, especially the surprise appearance of the fox in the lobby during intermission. The interactions with the puppets were fun, well executed and helped bring the story to life. I loved the various beautiful sets and incredible costumes which perfectly reflected that time in history. The talented dancer who played the lead role of Mary Lennox had graceful lines, incredible techniques, and strong theatrical skills with excellent comical expressions. We all wondered how she was able to keep up her high energy levels and flawless dancing while being on the stage almost every minute of the performance. 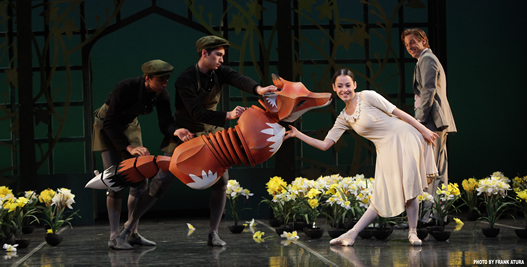 This ballet performance was a magical interpretation of the book and fantastic entertainment that utilizes the trio of dance, theatre and puppetry. Murray Homes is proud to support the Season Opener of The Secret Garden that will be performed again at the stage of the FSU Center for the Performing Arts October 24-26. This is definitely a must-see for all ages! This entry was posted in Sarasota Information by admin. Bookmark the permalink.